This recipe looks interesting on paper It calls for dark brown sugar, two kinds of chocolate and starts with cold butter which usually gives cookies rounded edges and a great texture. Also, it lacks vanilla. I’ve heard people say that leaving out the vanilla gives the cookies a more “pure” flavor. Hmmmm. Maybe. I love vanilla, but I left it out and followed the recipe as written. The dough was very stiff, but the cookies still baked up kind of flat and the chocolate (Green and Black’s 70%) melted into big pools. I like how easily good chocolate melts when I’m using it in brownies and I love Green & Black’s, but I don’t like when it puddles up in chocolate chunk cookies. 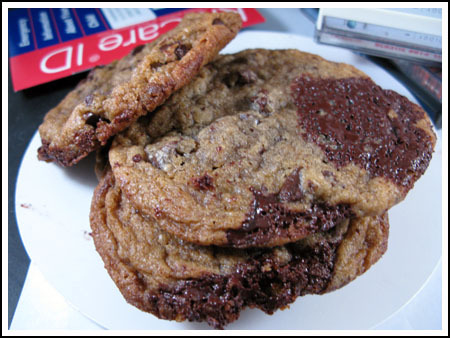 I also wonder if maybe the butterfat content of the chocolate played a part in the cookie’s lack of thickness. To test, I made a cookie with chocolate chips and no G&B and it did come out slightly thicker. Another thing I tried was throwing more flour into the remaining dough. Thinking I’d err on the side of too much flour just for experiment’s sake, I add more to the remaining dough. The cookies with the extra flour were slightly thicker and better, so I think TK must use around140 grams per cup rather than 135 grams per cup. Then again, I don’t know. But next time I’d scoop the flour and pack it a tiny bit more than I did or I’d weigh a good 140 grams per cup. Either way, the cookies are really good and I’m looking forward to buying the book. Oh, and finding molasses sugar! I’d never even heard of that until today. I thought brown sugar was molasses sugar but there’s another one. Hmm.. I’ve been using 125 grams of flour per cup. I’ll use 135 grams from now on, because that might explain why my Goop ccc came out so flat. I just remembered what called for molasses sugar. It was for a spice rub for salmon or pork for the grill. Funny you ran across a recipe calling for molasses sugar. I can’t remember what it was, and I’m not home to check my recipes, but I came across a recipe within the last month that called for molasses sugar. I think it was berry muffins or rhubarb something. I didn’t have any molasses sugar and the recipe only called for a little, so I used a small amount of dark brown sugar. Probably another fad food. AJ, when I was in Italy all I saw was muscavado sugar. I think that might be more of the norm in Europe but am not usre. Apparently molasses sugar is a little dryer and more like granulated. Muscovado, from what I’ve read, is just a little stronger. I only see it listed in a few gourmet style recipes. These look fantastic, even with the “pooling.” It makes them look even gooey-er, which, for me, is a good thing. Yummy. And interesting stuff there about the brown sugar. Who knew? Will you be posting today’s results? This comment has nothing to do with today’s cookie but I was just wondering if you had any suggestions for what kind of cookies to make for a graduation party? Carrie, thanks for the scoop on the molasses sugar. I’ll bet it also makes a thicker cookie. Today’s cookies were very good, but they just didn’t look quite the same as Bouchon’s. Then again, I’m not sure Bouchon uses that recipe. Anna, I’ve seen (and purchased) the molasses sugar from Whole Foods (in CT, but that link you posted suggests WF in TX carries it). It was a while back, so my memory could be spotty, but I think it wasn’t quite as moist as your standard brown sugar. It also went hard REALLY fast. Now, I don’t bake near as much as you and the package is small, so you may not have that problem. Was it better than regular brown sugar? Probably. But, apparently not so much that a) I remember or b) went back and bought more. Will have to try these this week! Carolyn, I’m going to try a second round tomorrow with 24 hour chilled dough and a different brand of chocolate. Rita, I’m glad you had faith in me. Mary, that’s just about the nicest compliment anyone’s ever given me and I’m glad the fact I used 135 grams per cup of flour meant something to you. LOL. So many people would look at that and think I’m nitpicky, but those little things matter….or so I am learning. I can always depend on you – no snark intended believe me – to cover my baking back. You make it hard for the rest of us to make a mistake. Thanks, Anna. I’ve seen this recipe yesterday as well! I thought it was really interesting, specially the sifting chocolate part! I’m glad you tried it, I actualy knew you would ;)! They look great! Glad you tried the recipe and liked it, even if you found you had to add more flour. It’s surprising how you don’t miss the vanilla, huh? I’m a big vanilla fan just like you are, so I was skeptical at first. But the cookies taste fine without them. I even think you end up tasting the chocolate MORE because of its absence.